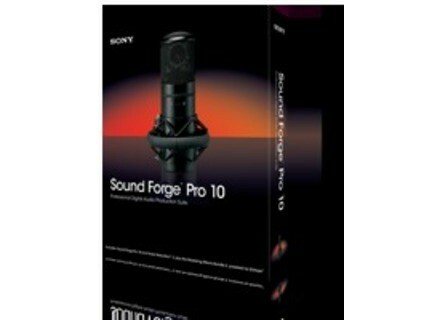 Sound Forge Pro 10, Digital Audio Editor from Sony in the Sound Forge series. Product replaced by the Magix Sound Forge Pro 13. 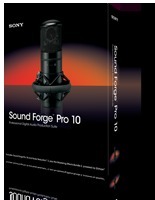 Sony Creative Software has updated Sound Forge Pro to v10.0b. When applying effects to a selection that includes the beginning or end of a file, automatic crossfades are no longer applied to the beginning or end of the file. Fixed a bug that could cause a crash that could occur when rendering to AVI format using templates copied from Vegas 8. Fixed an issue that caused the OHCI Compliant IEEE 1394/DV external monitor device to be unavailable in the Japanese version of Sound Forge. Fixed a bug that prevented audio from being rendered when using Windows Media Video templates after clearing and reselecting the Include audio check box. Fixed a bug that prevented Sound Forge from reading command markers saved in Windows Media files created with earlier versions of Sound Forge. Fixed a bug that prevented some VST plug-ins (such as EnergyXT and Delphi VST Project) from being used in Sound Forge. Fixed a bug that could cause incorrect previews when mixing a mono source to a multichannel destination. Fixed a bug that could occur when attempting to save .wav files in CCITT-ulaw format. Fixed a bug that caused real-time preview to stop after 10 seconds when using time-altering plug-ins. Fixed a bug that could cause the Paragraphic EQ plug-in to produce distorted audio when using the Remove very low and inaudible frequencies below 20 Hz preset. Fixed a bug that could cause incorrect previews when applying effects to events with individual channels selected. SoundToys v4 SoundToys has announced the release of SoundToys V4, offering two new plug-ins, a new built-in preset management system and an exclusive V4 set of presets. de la Mancha GTS & Group Buy da la Mancha has announced the release of GTS plus updates for GTO, GTX and GTA (to rev. B). Line 6 Updates GearBox Line 6 has updated GearBox for Windows and Mac OS X to v3.72 - This release adds support for Windows 7 and Mac OS X 10.6.